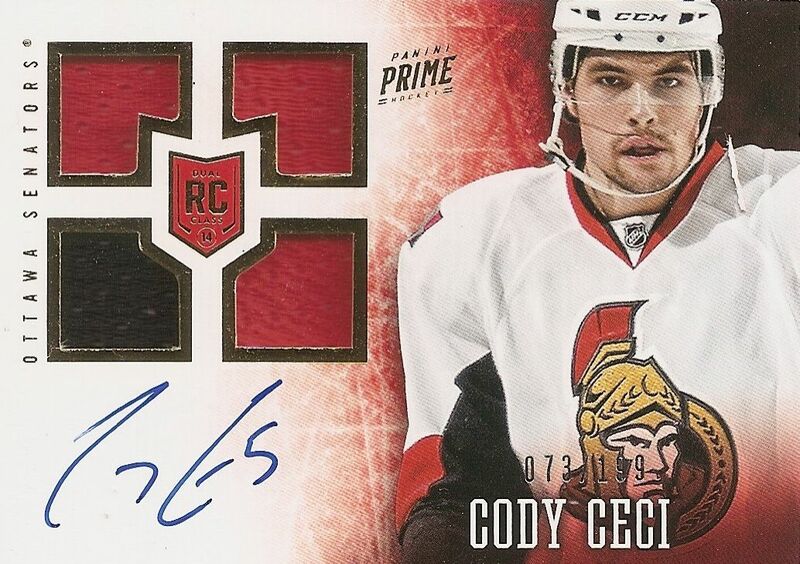 Panini Prime Hockey has been one of the best received products in Panini's line of hockey cards. Collectors love the opportunity to pull insane pieces of memorabilia in the form of the Prime Colors set. This final release of Prime is poised to really blow those who buy it away as it looks like Panini has emptied their player-worn vaults of all its best pieces. Prime base cards come on thick, premium card stock and are numbered to just 299 each. The Prime base has the same general design scheme as it had in the past. You've got gold foil with a large photo of the player in the middle. 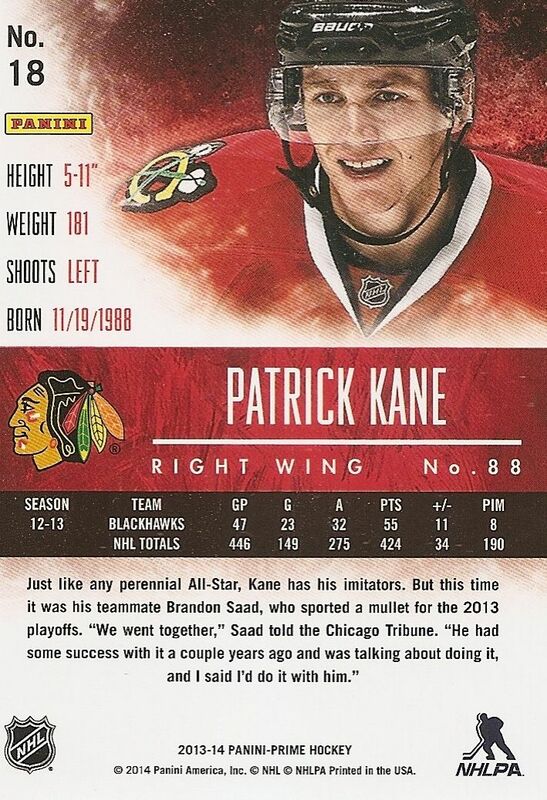 To me, these base cards have always had sort of a Hollywood poster feel about them - particularly the fonts. It's an 'ok' look, but not my favorite for such a premium product. This year's Prime base do have a darker tone than from past iterations. The background has strong vignetting. For teams with darker color schemes, the background can look almost black. The back of the base card has a clean look that matches up with the front very well. Again, I don't feel that the back has a super-premium feel to it. It's more 'artsy' and retro than anything else. I do like how the backs have a design that incorporates shapes, colors, and a photo. Some of Panini's products don't do that. The quad-piece memorabilia and auto rookie cards have returned to Prime. Like the standard base cards, these cards have been given a slightly updated look but clearly carry on the Prime lineage. 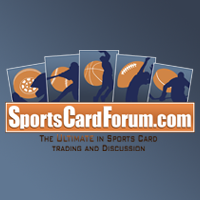 These cards are horizontally oriented with a large spaces for the player photo, memorabilia, and on-card autograph. There is no wasted room on the card, the elements come together nicely. 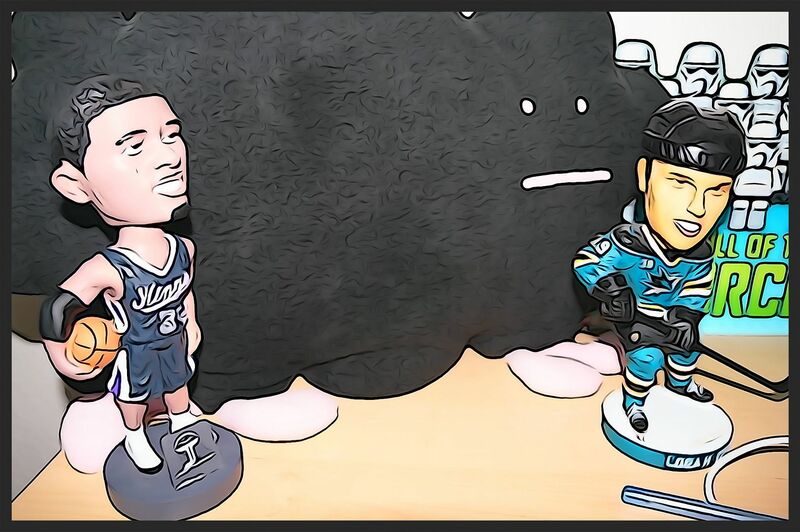 If you've enjoyed these rookie cards in the past, you'll probably appreciate these. I for one would have liked to see an updated look - but since this is the last year of Prime anyways, it's not a big deal. Buying a pack/box of Prime is like getting a concentrated brick of hits. There are a few base cards in the pack, but the majority of the cards will be autographed or memorabilia. The box states that there are four hits, but Panini has definitely included more than their stated number. Parallel versions of the base cards exist in Prime, and you'll probably find one in your box if purchase one. 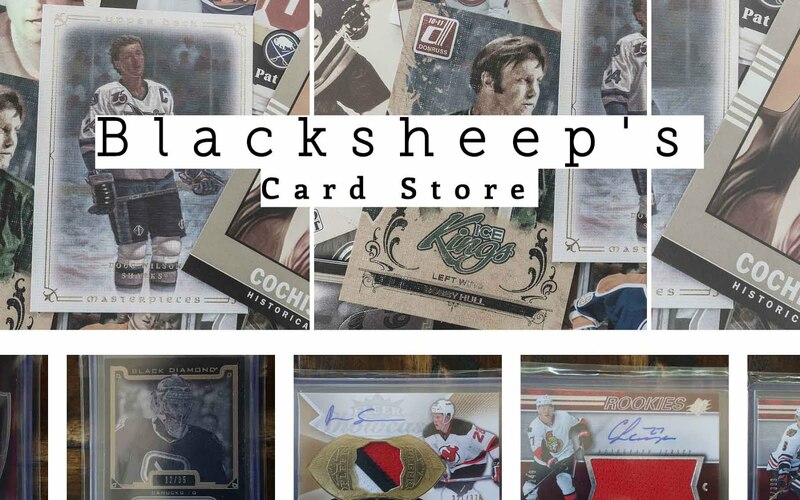 The rarity of the card is clearly stated at the bottom, and as with many hockey card products on the market, different colors of foil correspond to different print runs. 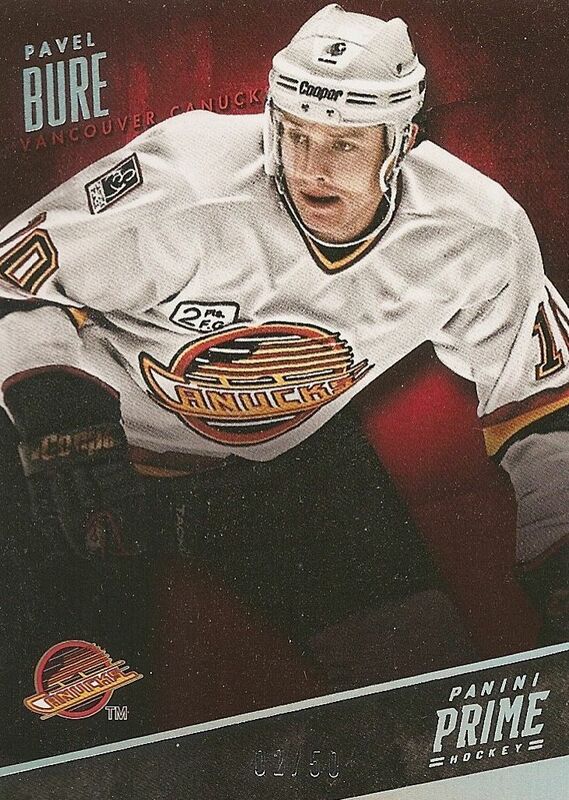 The Pavel Bure parallel card from my box is numbered 2/50, and has a silvery-rainbow foil denoting that it is different than a standard base card. The quad-memorabilia/auto rookie cards also have a number of parallel variations to them. 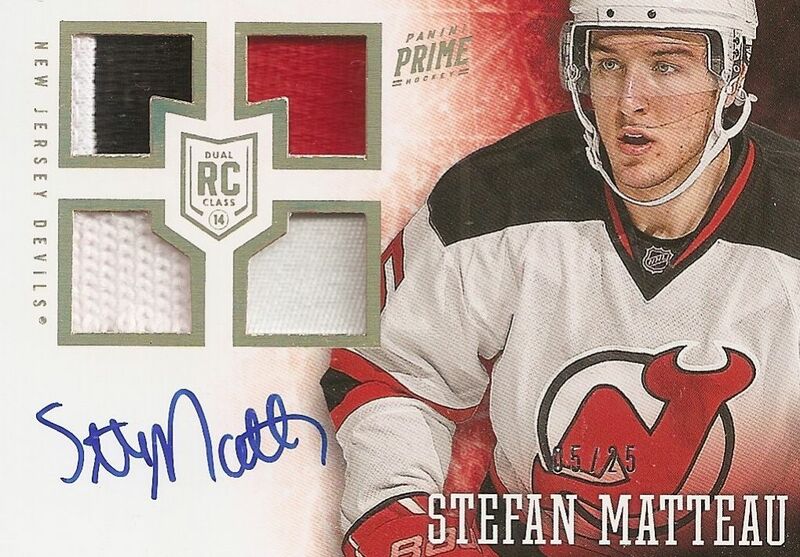 Aside from the Cody Ceci rookie, this Stefan Matteau was also included. Rather than just four standard jersey pieces, this card has pieces of patches in it - and maybe a fight strap as well. Like the Bure parallel, this card has a shimmering foil on it that makes it stand out. A lot of the memorabilia cards in Prime will feature multiple players on them. And the most common type of memorabilia card are these 'word' cards. Panini has paired players up according to similarities that a player shares with another. It could be the same team, same name, a minor league connection, or other reason. It's fun sometimes to figure out why some players are together, but in general, these cards are probably the least exciting hits to find. Sure there are patch variations that could be very nice, but still there are much better things in Prime than these. Seams Incredible cards make their way back into Prime. These unique cards have always been very low numbered. 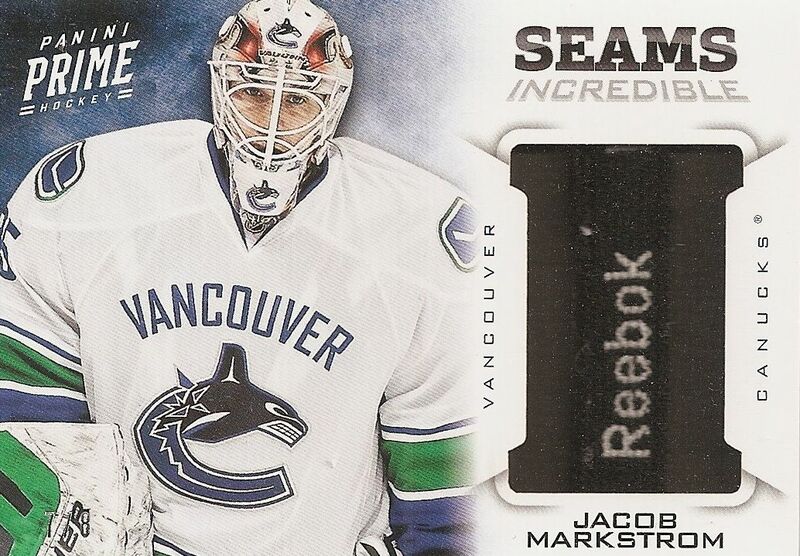 the Markstrom that I pulled is numbered to just eight. 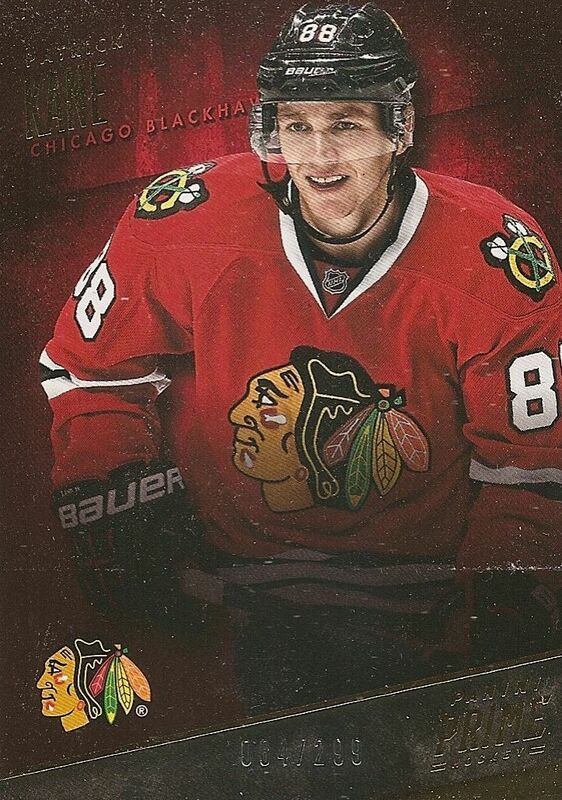 For player collectors, these cards are always a bit costly to get a hold of and find. The memorabilia is thin and small, and usually will say 'Reebok' somewhere on it. They make a nice addition to any PC. My box of Prime did come with of the Prime Colors cards. These cards are pieces of large logos and emblems from players' jerseys. The number of cards is dependent on how big the patch is. 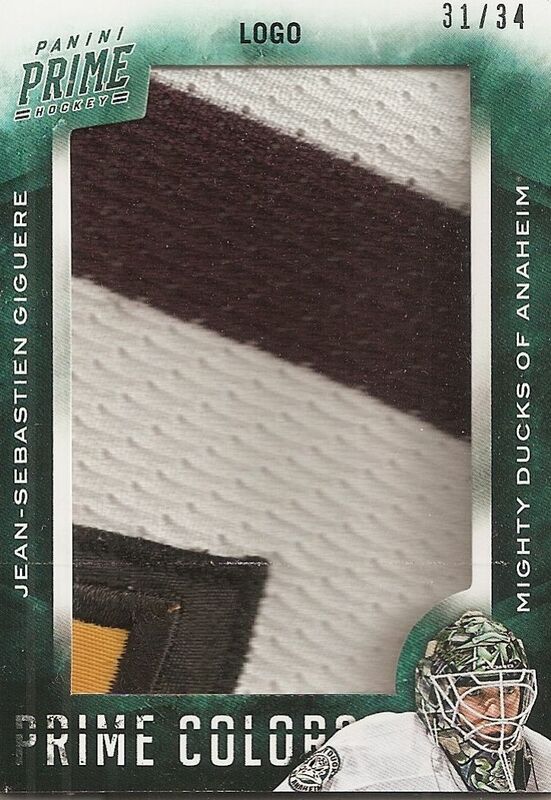 My Prime Colors was from Jean-Sebastien Giguere's Mighty Ducks logo. While 34 may seem like a low number, that is actually quite a few pieces in terms of one logo. My piece looks to be the upper part of the circle in the Mighty Ducks logo. My piece has some nice breaks and shapes, but really nice Prime Color cards will feature very recognizable parts of an emblem - and those command premium prices on the secondary market. 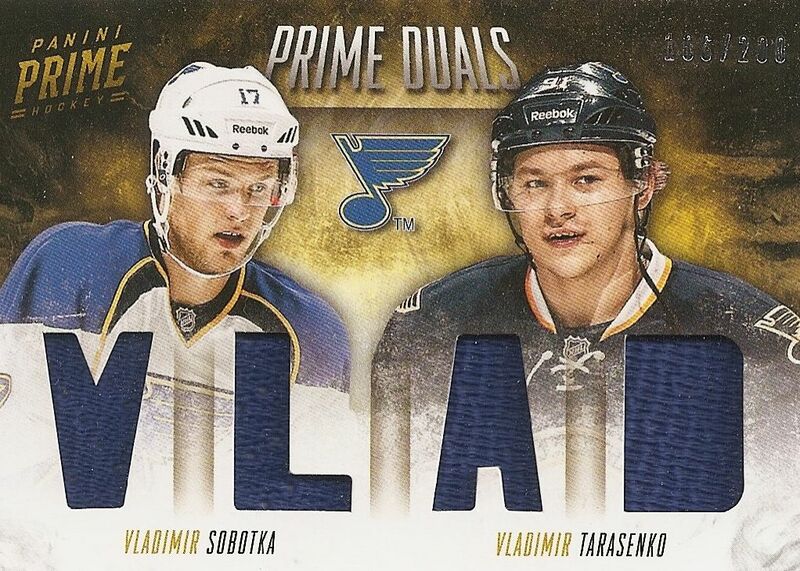 My box of Prime had one more hit in it - a redemption for a Vladimir Tarasenko auto/mem rookie card. But one box of Prime will never give you a good selection of cards that represents the entire set. If you want to see all the amazing cards that can come out of Prime, I suggest watching box and case breaks of it on Youtube. You'll see some great cards! Prime is a very likable product with amazing hits available to be pulled. Boxes are around $200 each, so it's not for the faint of heart! Prime is a product that is loaded with specialty memorabilia hits. In terms of autographs, you won't find much aside from the rookies. I think Prime is tremendously fun to rip and open, but I have a hard time sinking a lot of money into it because it is so heavily memorabilia focused. In my book, autographs are a step above in terms of hit content, so while Prime does have very cool looking things in it, I tend to desire ink more. But that's just me. If you're looking for beautiful pieces of patches, Prime cannot be beaten. It's entire reputation is based on the crazy tangled up patches in the product. And yes, Prime does have a very good reputation. I think prime was very good. Love Your reviews and videos!! Opened many boxes and i pulled some beautiful cards! LOADED I love the product and you got a pretty good box! Love the prime colors, they seem to be easier to pull this year. Great Break! I love Prime. I think this product is really cool. the base cards look awesome! your videos are spectacular. I saw the break on cards infinity. Product looks great. Wasn't really a fan of last years prime, but those quad rookie autos look sharp! This product is a good mix of quality and quantity. Unlike dominion or other high end products you get a lot of hits for your money but you dont have the overwhelming number of base as you do with a products like Series 2. Great review and I love your videos! + Almost every box has one or two great cards. + The Prime Colors set is as always filled with nasty patches. - Panini have not been that much innovative with their last Prime product, since the design is almost the same as earlier on. Sure, the design is great looking, but one new card set or two wouldn't hurt. Really nice looking cards! The Prime Colours looks really cool! Wonder if National Treasures and Ultimate Collection coming out later in the month will hurt Prime, because its pretty damn hard to afford all three! Prime has gotten better as the years progress and this year is just awesome. Panini advertises the four hits per box but most have five to six. Your box was amazing and it seams that most are. Primovera! Beautiful - great break. You mentioned ink being more desired than memorabilia and I agree. Prime does have beautiful on card autographs - 5 of the 6 hits I got in my box were autograph cards... so I guess I lucked out. I enjoyed Prime this year. It's $250 for it in here in Canada, so I'm definitely not buying more. very nice box love prime wish I could buy a box very colorful product and always produces very nice cards. Great break. Don't stop your Logan pc! It brought you obvious joy at one time and you will regret selling it in a few years. Just take a small "break" from collecting Logan. I have a huge pc of Ben Bishop which I wouldn't sell for the world because it has and continues to bring me joy and I know in a few years, when I stop collecting hockey cards (if I do) I will look back and be thankful I kept all of his cards. Prime this year over tops the past two years of Prime by a whole lot in my opinion, the hits are amazing and the value you get back is terrific.